Are we running out of items for the long-running series on Top eBay Chess Items by Price (March 2010)? For this current edition I had the choice of a tournament program signed by the participants, a GM scoresheet signed by the players, a set of chess magazines, and a box. Since I've already featured examples of the other items, some several times, I went with the box. Titled 'An Early 19th Century Chess Set Box', the item pictured below sold for GBP 3356.00 ('approximately US $4,706.12'). Starting at GBP 199.99, the auction lasted a week. After five days the price reached GBP 1800, when bidding stopped. Seconds before closing the price jumped to GBP 3200, and after a few more bids ended at the price shown. The bidding history showed a total of 22 bids from 7 bidders. This antique chess set box I think dates to the early 19th century but possibly a little later. I am not certain what the box is made of but looks like a lacquered papier mache or composite material but not certain. 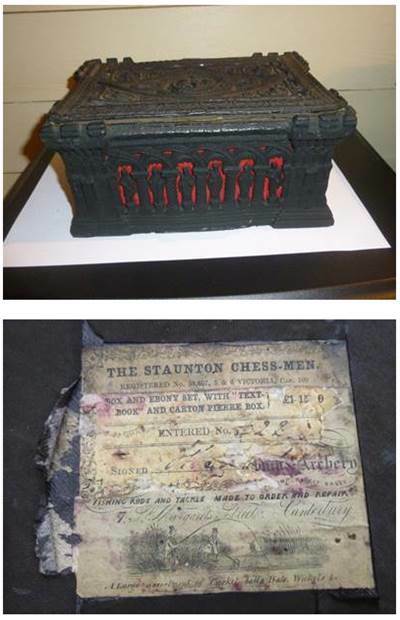 The box has a lovely design of a castle with the walls having chess piece figures and symbols with chess board designs on the ends as seen in the photos. The box is really well made and quite large measuring 8.25 x 6.25 x 4 inches. Inside there are cloth linings which I think are later additions. The lid lifts off but not sure if originally attached. Underneath there is a retailers or makers label as shown with a number 22 but with possibly another number before them and signed beneath. The box is in pretty good condition. I think there have been a few repairs in the past and new material underneath, a few minor knocks and general wear and tear with age and use. A large assortment of Cricket-balls, Bats, Wickets, etc. Chess men, racket balls, fishing rods, and cricket -- what's the connection?